Ethnic wear is such a simple term for a complex set of standards. It can range all the way from simple Kurtis to fancy sarees. It is easier to break it down into the various types of occasions in order to decide which outfit is appropriate. For events that require more conservative and traditional clothing, I stick to wearing half-sarees and more traditional looking sarees. For parties and dressy occasions, I wear more modern looking sarees that are usually adorned with stones and sequins. Growing up, I would always wonder why my parents would force me to wear Indian clothes to family occasions, even when some other kids would just be wearing pants and a t-shirt. I used to always beg to just wear jeans and a nice t-shirt, but I recognize the importance now. 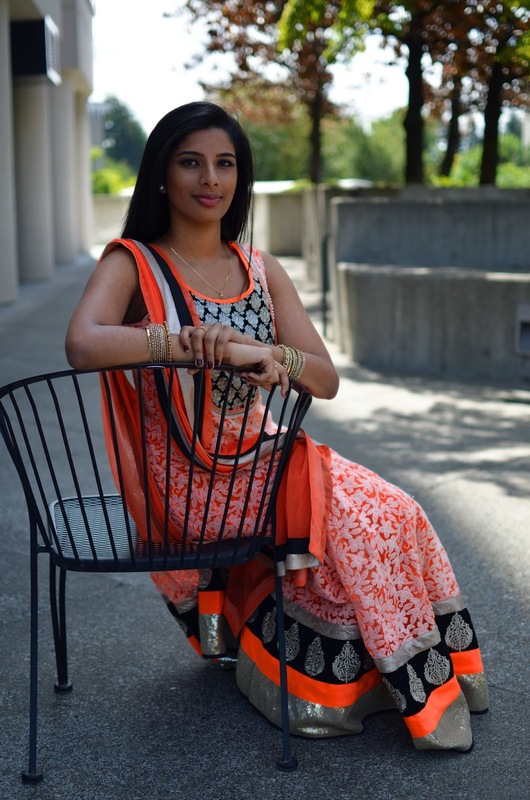 Wearing ethnic clothing is a big part of how I stay connected to my culture. It teaches me how to act and present myself appropriately in whatever setting I am in. At Puja, I wear more of a timeless, classic looking saree, but at parties it is often okay to wear something more contemporary. While there is nothing wrong with showing up to a party in a western dress or jeans, I’ve always just found it as a way of paying respects to the hosts, by dressing according to the event they are putting forth. In the first look, I am wearing a silk half-saree, with intricate threading designs. I paired this with traditional, gold jewelry. The golden belt worn around the waist, called a vaddhanam in Telugu, is only worn for grand occasions in my family, but it complements silk sarees well, especially the sarees have a gold trim. The second look is also a traditional silk half-saree. This was designed by my aunt in India for my vocal recital. The occasion demanded a grand appearance, so I wore even more gold jewelry. Even with traditional dresses, there can be a variation in the types of blouses worn. In the first dress, the blouse was shorter, and had a deeper cutout in the back. In this dress, the blouse was more conservative and had longer sleeves. Moving onto more contemporary looks, this is a realm that I feel is constantly changing. Traditional clothing is more timeless, and standards stay relatively the same over time. With contemporary fashion, it is constantly changing and evolving. By the time I get new clothes from India, the trend already changes! When going to simple and casual things like dance practices and music classes, I opt for a simple, cotton salwar, or kurti with leggings. These outfits don’t require any grand accessories, and do not stand out as much. But they still incorporate a part of the ethnic clothing of India. For most parties and get together, I stick to wearing Salwars and Anarkalis, because pants and skirts are much more convenient to move around in. (what are these, describe!!! ), just because they are easy to manage, and they look great! The pants that are usually given with the suits are not convenient, so I substitute those with a pair of colorful leggings that I purchased separately. Heavy jewelry isn’t necessary either. I usually just put on a pair of earrings and some bangles, and I am good to go. If a fancier party, I wear a pair of heels along as well. This is what I represented in my 3rd and 4th look. The last and final look is very grand and something I would wear to a huge party or a wedding. For more formal events, I wear more ostentatious outfits, made with more sequins and glamour. These types of clothes are always in mode, but more and more variations of them keep developing. 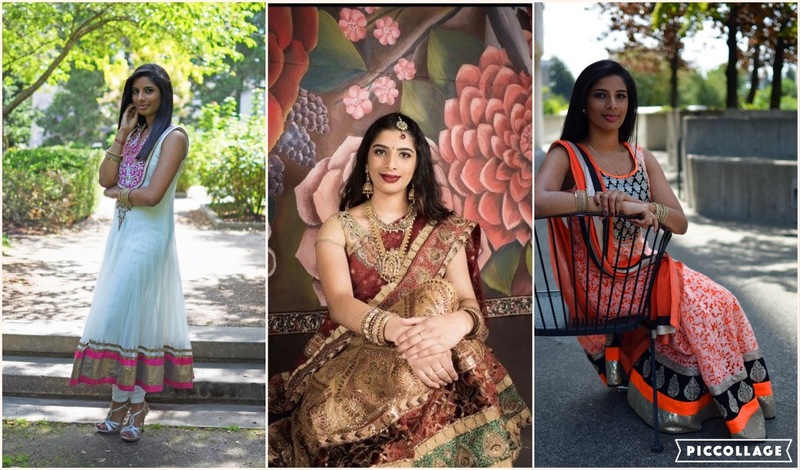 Ethnic wear is a huge part of how I connect to my Indian roots. Today, I am so thankful that my parents forced me to wear those dresses when I was younger, because as an adult, I have a greater appreciation for them now and how it allows me to represent my culture in an elegant and beautiful way.